He’s been trending every day on Twitter. He follows just 42 people yet has 6.7 million followers. 6.2 million people have liked his Facebook page and 60 million have watched a recent TV interview on You Tube. He courts controversy, has been described as a vulgarian and a conman. And he’s likely to be the Republican Candidate in the race to the White House. Can the world of marketing learn anything from his unorthodox brand building? Well, he’s clear on what he stands for – Making America Great Again. He’s selling a dream. It’s a simple enough message and, although he’s suggested some pretty unpalatable ways of achieving this, they do all tie into this one key benefit. He’s certainly differentiated himself from the other candidates - play it safe and you struggle to break out of the pack. And he’s a master at grabbing attention – he’s spent considerably less than any of the other main candidates including Hilary Clinton, yet he pulls in the biggest TV audiences and covers more press pages. He also knows his audience – he’s not trying to appeal to everybody, but he’s speaks with an authentic voice to his supporters. And nobody comes anywhere near him on the social media front – real-time marketing at its best. I’m fascinated by him and can’t wait to see how it all plays out. He’s a bit of a niche brand, which will keep him going until November. But he’ll need a broader appeal and a toned down message to stand any chance of making it to the White House. Won’t he??? Oh yes, and the 42 people he follows. I was curious. Turns out that half are his family members, most of his business concerns are there and ….Piers Morgan. 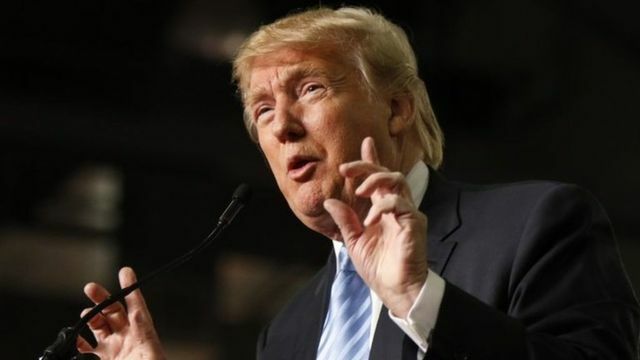 Despite an outcry from fellow Republicans after increasingly controversial statements, billionaire Donald Trump continues to lead the field of candidates running for president. But can he turn this support in the polls into votes and win the Republican nomination, or even the presidency itself?